If the ignition switch is turned from the ON to the ACC or LOCK position during test mode, DTCs related to the signal check function will be cleared. During test mode, the skid control ECU (master cylinder solenoid) records all DTCs related to the signal check function. By performing the signal check, the codes are cleared if normality is confirmed. The codes left over are the codes where an abnormality was found. (b) Check that the steering wheel is in the straight-ahead position. (e) Connect Techstream to the DLC3. (g) Switch the ECU to test mode using Techstream. Enter the following menu items: Chassis / ABS/VSC/TRAC / Utility / Signal Check. (h) Check that the ABS warning light and slip indicator light blink at 0.125 second intervals (0.125 seconds on and 0.125 seconds off). If the ABS warning light and slip indicator light do not blink the ABS warning light circuit and slip indicator light circuit. (a) Keep the vehicle stationary on a level surface for 1 second or more. Acceleration sensor check can be performed with the master cylinder pressure sensor check below. (a) Keep the vehicle stationary and release the brake pedal for 1 second or more, and quickly depress the brake pedal with a force of 98 N (10 kgf) or more for 1 second or more. Keep the vehicle stationary and release the brake pedal for 1 second or more, and quickly depress the brake pedal with a force of 98 N (10 kgf) or more for 1 second or more. While the ABS warning light stays on, continue to depress the brake pedal with a force of 98 N (10 kgf) or more. The ABS warning light comes on for 3 seconds every time the above brake pedal operation is performed. 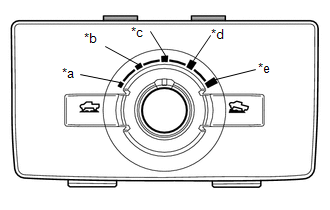 (a) Check the 4WD detection switch (4WD position). (1) Push and turn the 4 wheel drive control switch to put the vehicle in 4WD mode. (2) Push and turn the 4 wheel drive control switch to put the vehicle in 2WD mode. (1) Drive the vehicle straight forward at a speed of 45 km/h (28 mph) or more for several seconds. (3) Drive the vehicle in reverse for more than 1 second at 3 km/h (2 mph) or more. Drive the vehicle in reverse and check the speed sensor signal. Note that the signal check cannot be completed if the vehicle speed is 45 km/h (28 mph) or more. (4) Check that the ABS warning light goes off. Before performing the speed sensor signal check, complete the acceleration sensor, master cylinder pressure sensor and 4WD detection switch signal checks. The speed sensor signal check may not be completed if the speed sensor signal check is started while turning the steering wheel or spinning the wheels. After the ABS warning light goes off, if the vehicle speed exceeds 45 km/h (28 mph), a signal check code will be stored again. Decelerate or stop the vehicle before the speed reaches 45 km/h (28 mph). If the signal check has not been completed, the ABS warning light blinks while driving and the ABS system does not operate. When the signal check has been completed, the ABS warning light goes off while driving and blinks in test mode while stationary. (a) If the sensor check is completed, the ABS warning light blinks (Test Mode) when the vehicle stops and the ABS warning light is off while the vehicle is driving. When the yaw rate and acceleration sensor, speed sensor, and master cylinder pressure sensor checks are completed, the sensor check is completed. (a) Read the DTC(s) by following the Techstream screen. Refer to Techstream operator's manual for further details. (a) Turn the 4 wheel drive control switch to the L position to put the vehicle in L4 mode. (b) Press the MTS SET switch. (c) Check that the MTS SET indicator light comes on. (d) Press the MTS SET switch again to turn the MTS SET indicator light off. Move the vehicle either a little forward or a little backward to engage the L4 position. (a) Push the ON/OFF switch. The CRAWL indicator light illuminates while the ON/OFF switch is pushed. (b) Turn the speed selector switch to low. (c) Turn the speed selector switch to medium-low. (d) Turn the speed selector switch to medium. (e) Turn the speed selector switch to medium-high. (f) Turn the speed selector switch to high. (g) Turn the speed selector switch to low. (a) Press the VSC OFF switch. (b) Check that the AUTO LSD indicator light and VSC OFF indicator light come on. (c) Press the VSC OFF switch again to turn the AUTO LSD indicator light and VSC OFF indicator light off. 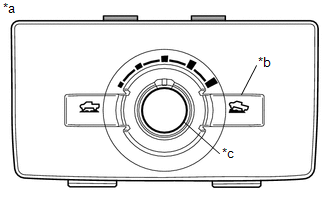 (a) If the sensor check is completed, the slip indicator light blinks (Test Mode). If the sensor check is not completed, the slip indicator light blinks even while the vehicle is driving and the VSC and traction control function do not operate.